I've been super busy with my home life lately and lots of stuff going on so I haven't been posting as much as I would like too. Hopefully I can hop right back on my baking blogger train and start sharing more delicious treats soon. Since today is February 29th I feel like I should have done something unusual but that's what happens when poor planning is involved. Anyway, lets get to the recipe! 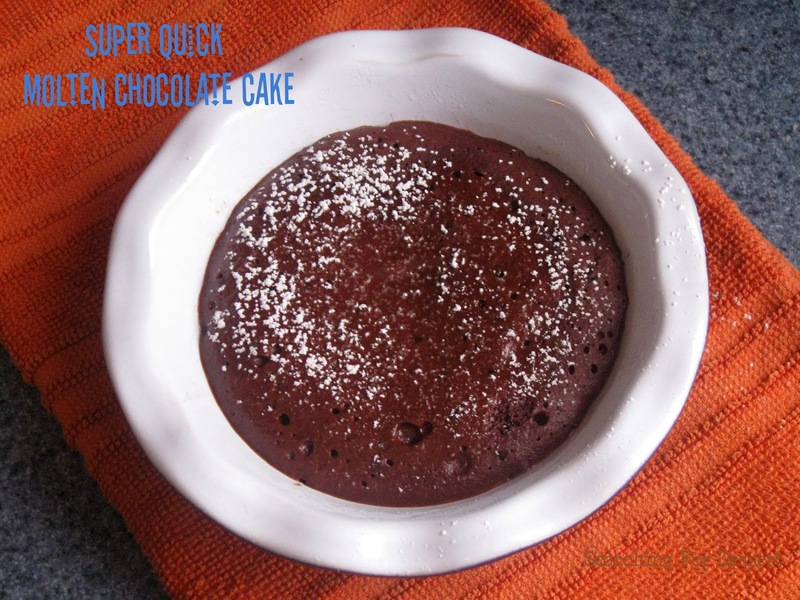 Are you looking for a quick chocolate fix? Do you have a microwave? I have the recipe for you then. It's warm, molteny (technical term) and delicious. It's also perfect for one but big enough for two if you're feeling friendly. :). I only have one picture because I was distracted and sort of ate the whole thing before another picture could be taken...oops. I could have just made another but it does serve one and I was the only person home so then I would have eaten TWO and that does seem a bit excessive don't you think? I seem to top everything with peanut butter so after the picture and before I gobbled it up I dolloped some peanut butter on it and stirred the whole thing up. Yum! Microwaving it for only 15-30 seconds doesn't bake it all the way through but that's the point of a molten cake of course. As a bonus there is no egg so there is no risk of undercooked egg, yay! 1. Combine dry ingredients and mix very, very well. Add liquid, stir, then transfer to a little dish or ramekin. 2. Microwave 15-30 seconds (depending on how powerful your microwave is). If you don’t want to eat it straight out of the dish, be sure to spray your dish first (and then wait for the cake to cool before trying to remove it).